I will always remember January as the month when I couldn't get out of bed for over a week straight. That dang flu bug took me down that year and I fell hard. I honestly haven't been that sick in over two years! Since I try to rely on natural remedies as opposed to drug store versions, I tried practically every home remedy I could get my hands on. The winners included gargling with salt water (to ease a sore throat), a hot bath with eucalyptus oil (to clear out the sinuses) and this Flu Buster Juice (to ease general symptoms/immune support). I won’t lie: this juice is intense. 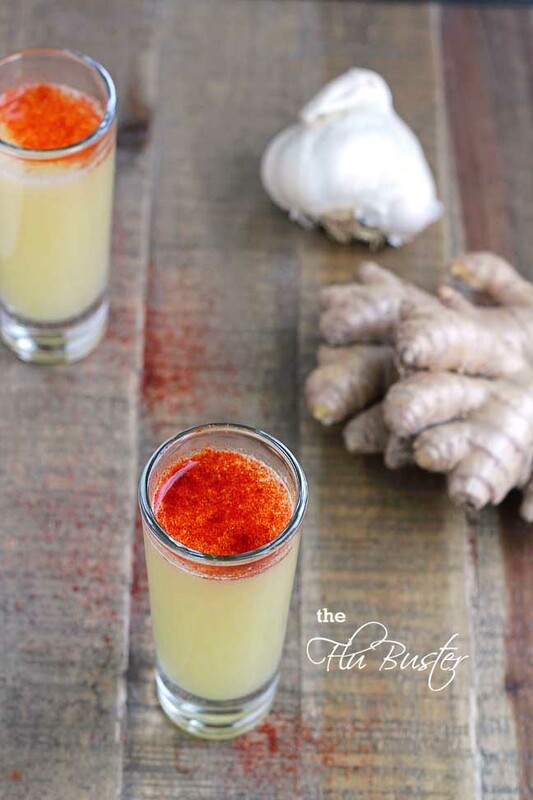 This juice is a powerful punch of lemon juice, garlic, ginger, and cayenne pepper to top it off. It’s powerful enough that just two ounces will do the trick. Bottoms up! Depending on the desired intensity, you can adjust the ratio of garlic and ginger. And if you can't handle the thought of downing this without a little sweetness, an orange will lighten this combo up and add a Vitamin C boost! 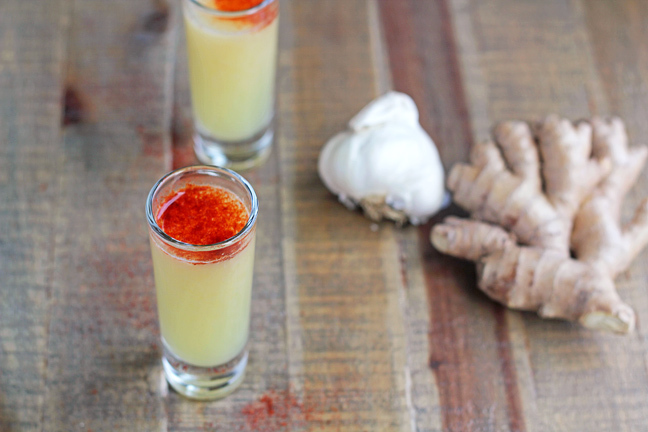 Juice lemon, garlic, and ginger and pour into shot glass (or regular glass). Top with a dash of cayenne pepper and drink. Eating a nutrient rich diet of whole natural foods is the only way to ensure lasting health. When you nourish the body with a vibrant living foods, as nature intended, you become an expression of health. Clean eating is in fact nature's secret to youthful longevity.